My experience with the Ride of Love started well before I participated the first time in 2016. For years, my sister, Madison Monday, tried to get me involved with the ride because I’m an athlete and she figured I could just up and do 150 miles, but I would always decline thinking I couldn’t find the time to train for something that major on top of already being a swimmer. I finally came around and decided I was up for the challenge, and I’m so glad I did. The ride of love definitely changed my life and it’s an event I will participate in for as long as I have legs. Sure it’s tough, but bringing joy and smiles to the children who are at On Therapy Family camp, and riding in remembrance of those who have passed due to cancer is an indescribable feeling. 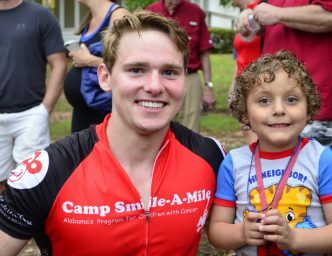 It all comes down to elevating others above yourself and your comfort, in order to bring happiness, strength and motivation to children who are going through something so much more tough than a bike ride. My favorite part about the ROL is riding into camp after a long, grueling day with a huge motorcade consisting of police, numerous support vehicles, and 60+ people you just became best friends with, and seeing how the children light up as you’re riding past them. The children look at you as if you’re a hero, but in reality they’re the heroes who possess the type of strength we should all envy for. Their daily battle with cancer takes them through so much more than we can ever imagine, and doing my part to raise money to fund Smile-A-Mile’s year-round programs that bring these children happiness is something I want to challenge others to do.